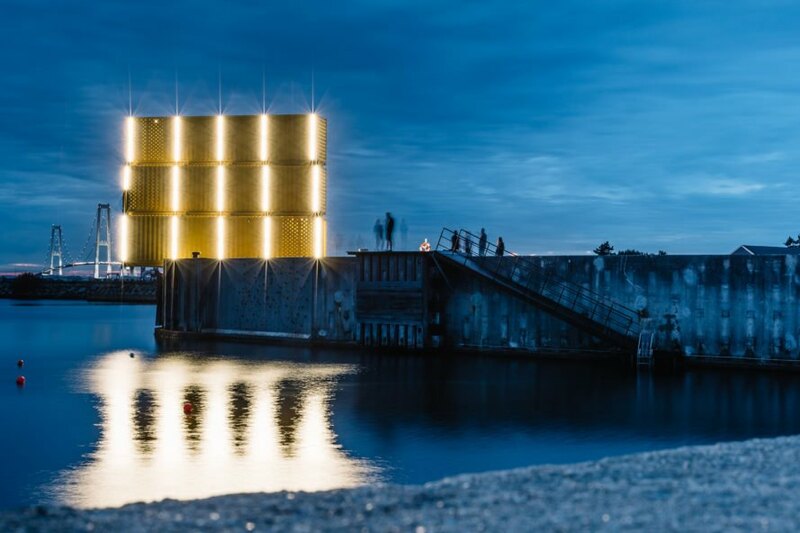 Sweco Architects just transformed an old ferry port in Denmark into a fantastic water recreation spot. 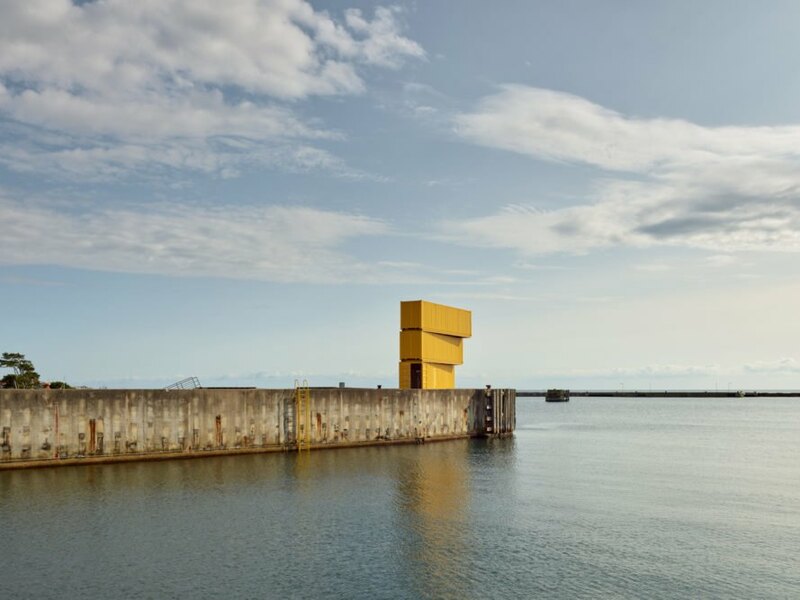 To keep the Water Sports Center Halsskov green, the architects recycled “as many materials as possible from the former port, either directly or through upcycling.” Perhaps the most distinctive element of the sports center is a jumping tower comprised of three stacked, bright yellow shipping containers. People can jump off a shipping container diving tower into the waves at the Water Sports Center Halsskov at heights of around 13, 26, and 36 feet. The stacked containers are rotated “to generate an interesting interaction between activity, shadows, and volumes,” according to Sweco Architects. The shipping container diving tower isn’t the only fun visitors can have at the Water Sports Center Halsskov. People don’t have to jump in to get wet; they can also access the water via ramps, ladders, and floating platforms. There are three beach volleyball courts, trampolines, an outdoor swimming pool, and a climbing wall, according to the firm. 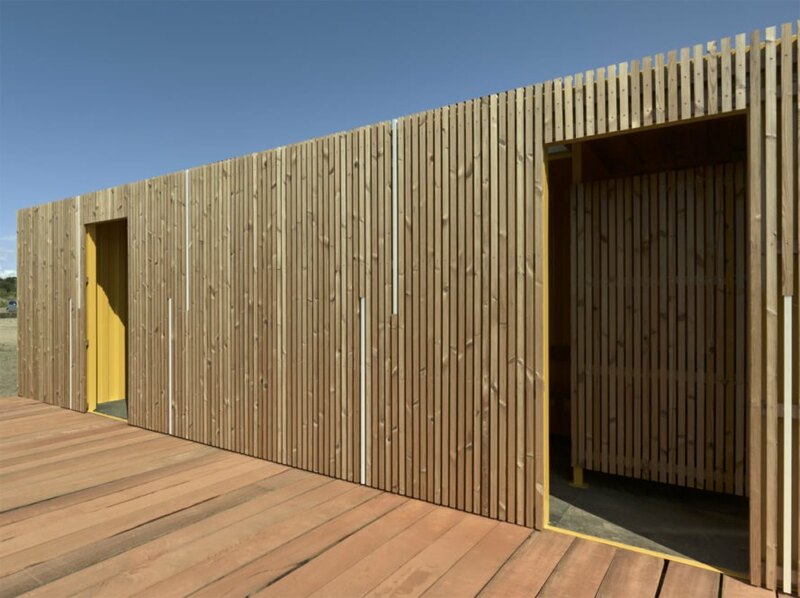 Facility buildings, also comprised of containers, offer bathrooms and changing rooms, and they’re covered with heat-treated wood from sustainable forests for easy maintenance. LED lighting is present throughout the site to minimize energy consumption. The project “emphasizes the special raw character of the site,” according to Sweco Architects. They exposed concrete piers and preserved pieces of bulwarks and harbor fittings. 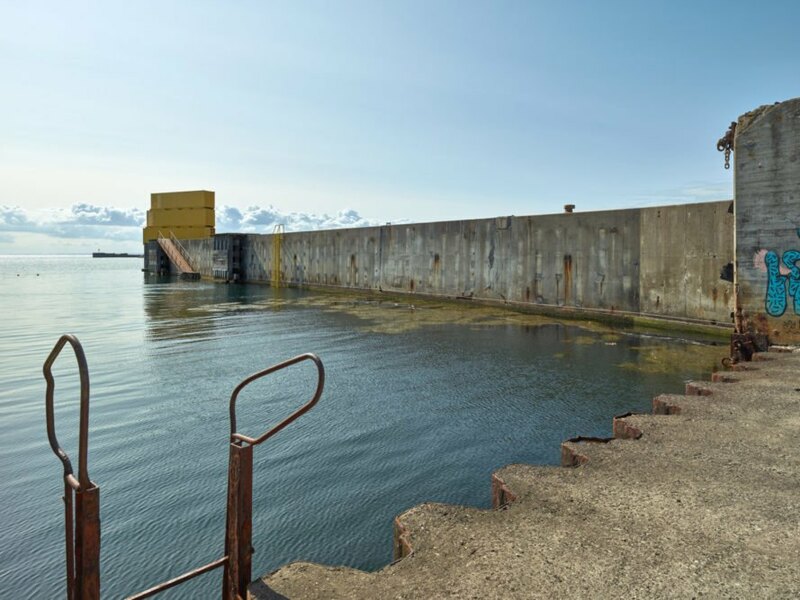 They said in their design statement that benches and boundaries “consist of the former bulwarks from the ferry port.” The Water Sports Center Halsskov was completed in 2017. An old ferry port in Denmark just got a facelift - Sweco Architects transformed the port into a fantastic water recreation spot. Their Water Sports Center Halsskov is an architectural invention, in their words, to give people access to the water. To keep it green, the architect's recycled "as many materials as possible from the former port, either directly or through upcycling." Perhaps the most distinctive element of the sports center is a jumping tower comprised of three stacked, bright yellow shipping containers. 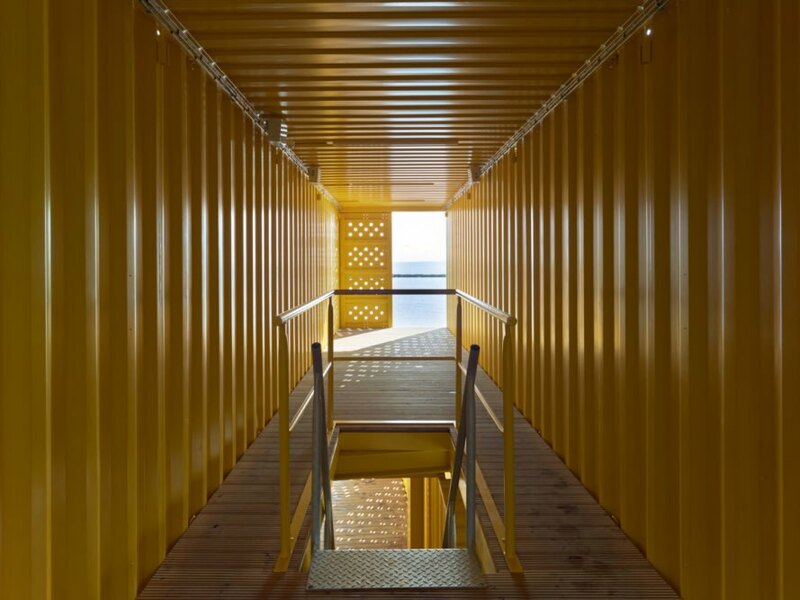 The stacked containers are rotated to create interactions between shadows and activity, according to Sweco Architects. 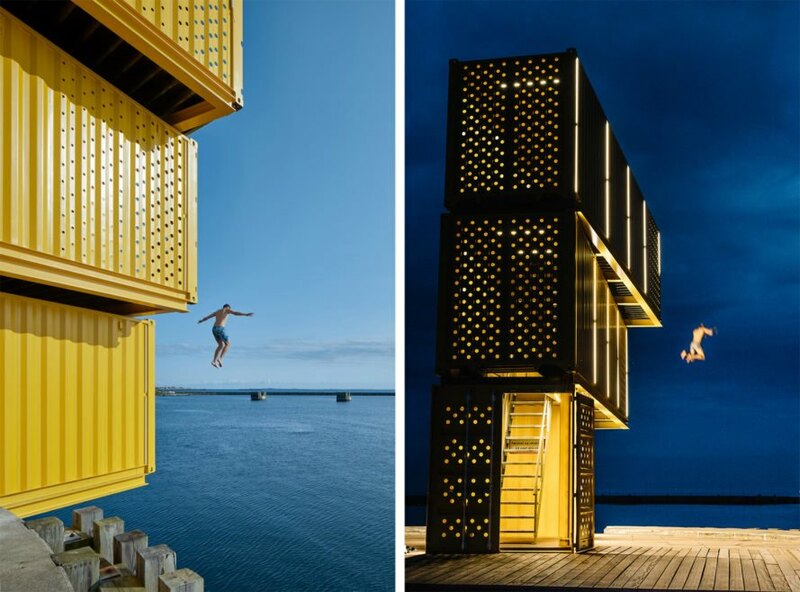 People can jump from this shipping container tower into the water. People can jump from heights of around 13, 26, and 36 feet. 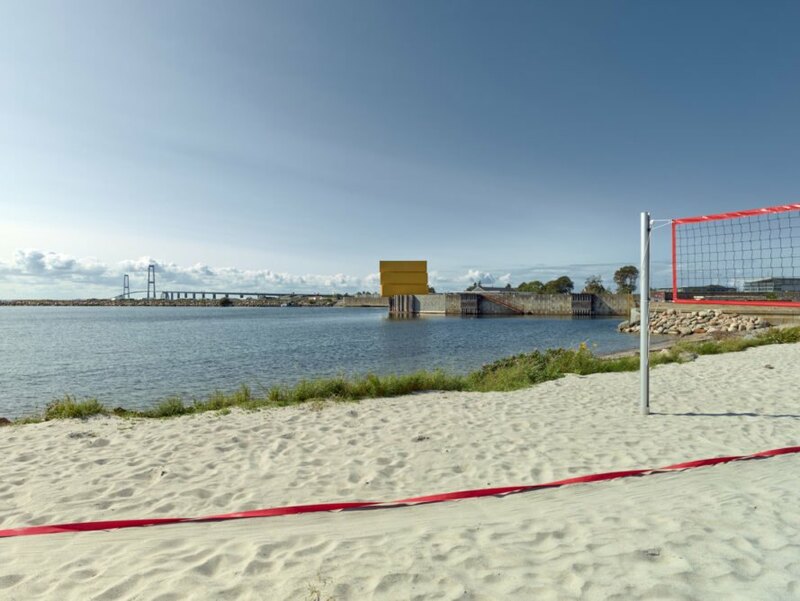 There are beach volleyball courts at the Water Sports Center Halsskov. The project "emphasizes the special raw character of the site," according to Sweco Architects. Facility buildings include changing rooms and bathrooms. Heat-treated wood covers the shipping container facility buildings. Sweco Architects just transformed an old ferry port in Denmark into a fantastic water recreation spot. To keep the Water Sports Center Halsskov green, the architects recycled "as many materials as possible from the former port, either directly or through upcycling." Perhaps the most distinctive element of the sports center is a jumping tower comprised of three stacked, bright yellow shipping containers. Sweco Architects transformed an old ferry port into the Water Sports Center Halsskov in Denmark.